Three great options for holiday music. The Yuletiders are dressed in lavish, Dickens-style costumes and bring tidings of cheer in 4-part harmony. 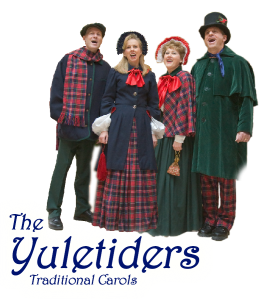 Enjoy the holiday sounds of the Yuletiders as they sing traditional classics. We’ll fill your event with the sights and sounds that make this holiday season so magical for the child in all of us. Three great options for the holidays. Bring first-class vocals to your event to make it a truly unique and enjoyable event. Your guests will love the live music and you'll love the experience of the Colorado Caroling Company!